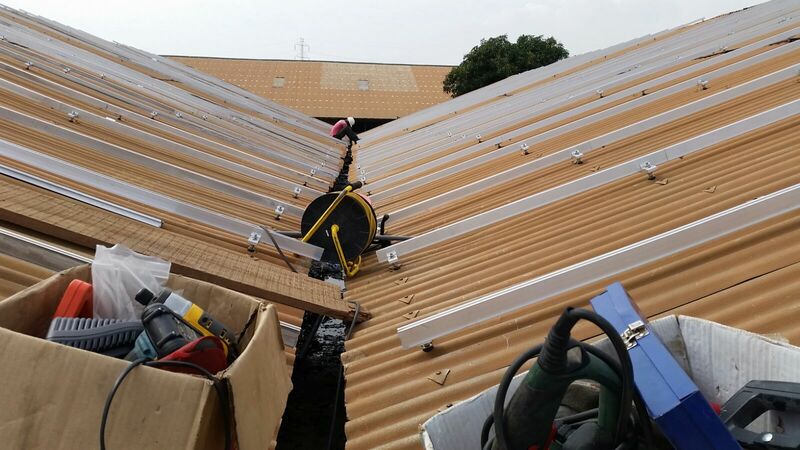 The first of several projects for manufacturing company Qualiplast in Ghana, Africa saw the installation of a 100kW Hybrid Solar PV system. 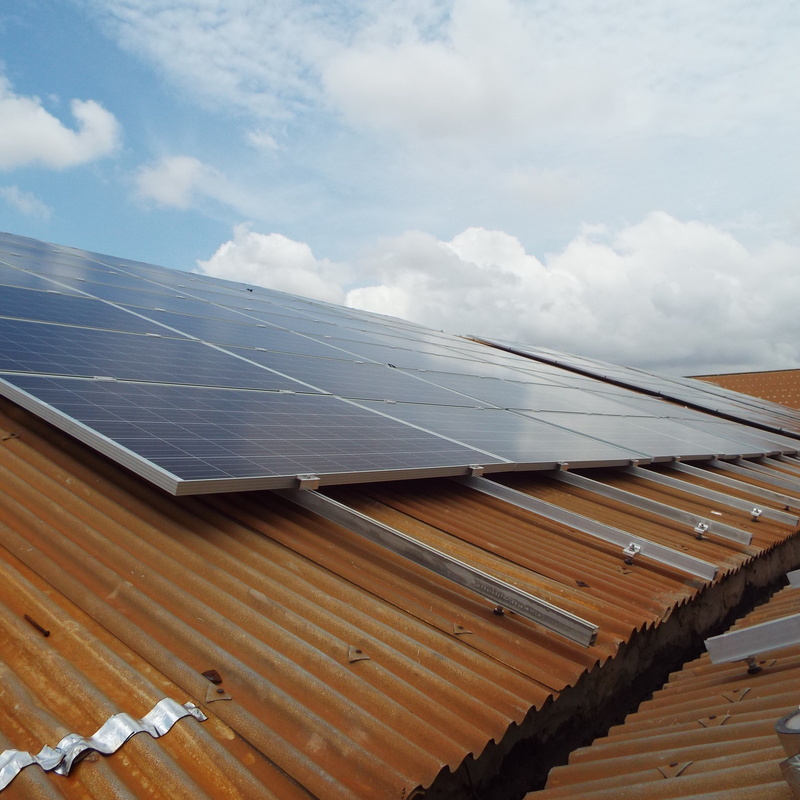 The PV Modules consist of a total of 384 JA Solar 265W Poly Modules which gives a total of 101.76kWp. These modules are mounted over four roofs with a total of 96 modules per roof. The modules are mounted in Landscape on vertical TRIC HDC Rail attached to TRIC BE (Ejot) Bolts that penetrate the roof and screw into the wooden beams that support the roof material. 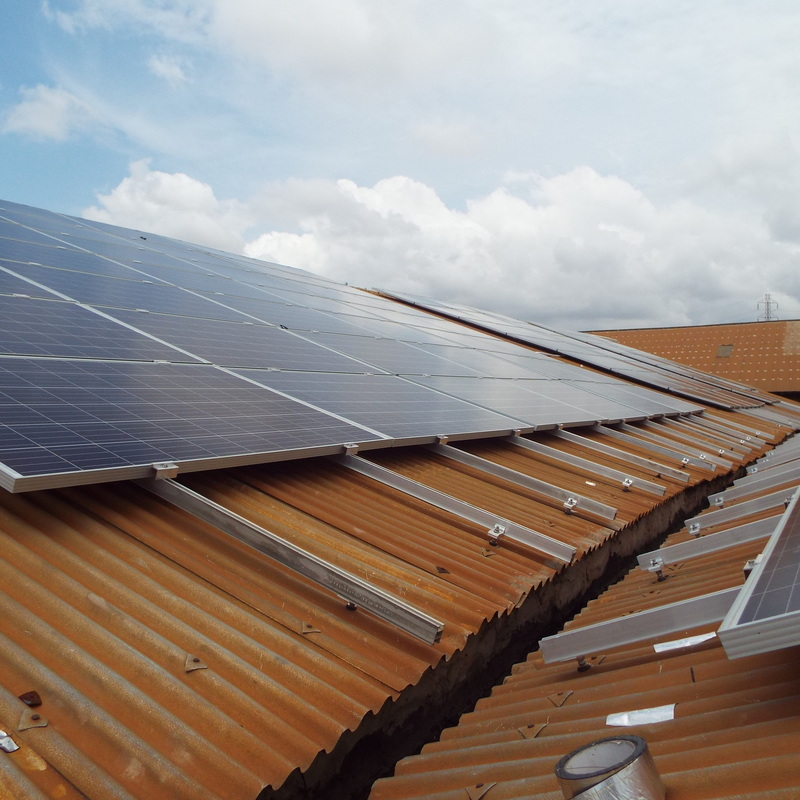 The modules are connected together in series making up strings of twenty-four modules therefore each roof will have four strings supplying an Inverter. The two West roofs will supply one inverter and the two East roofs will supply the second inverter as each inverter only has one MPPT. The DC cables from the modules are led down to DC Isolators so that each string may be isolated if required. The eight DC Isolators are then connected to an Inverter which can take up to ten inputs all of which are fused. The twenty-four modules connected in series can produce DC voltages up to 913V when connected together however allowing for roof positions, roof angle and temperature the voltages at this location are more likely to be between 650V and 838V depending on the position of the Sun. The Generation from the modules is estimated for each month of the year and is dependent on several factors so that each location will have a PVSol calculation done so as to get the estimated kWh generated monthly for that specific location. The Kaco Blueplanet inverters are each 50.0kW inverters which supply three phase supply and are grid tied inverters which means that they require Voltage and Frequency to be present for them to operate. If no grid Voltage or Frequency is available the inverters will not start up. The DC supply from the Modules is supplied to the inverters via the eight DC Isolators as mentioned above and the inverter has a DC Switch incorporated into the inverter so that the DC supply can be switched Off or On. The two Kaco Blueplanet Inverters are connected to a G59 panel. This G59 panel provides protection to the inverters as each inverter connects to its own 80A MCB in the G59 cabinet which allows each Inverter supply to be switched Off. In the G59 panel is also a MainsPro Mains Decoupling Protection Relay. The MainsPro monitors the Voltages and Frequency of the grid supply and if either the Voltage or Frequency go out of tolerance the MainsPro disconnects from the grid Supply thus protecting the Inverters. 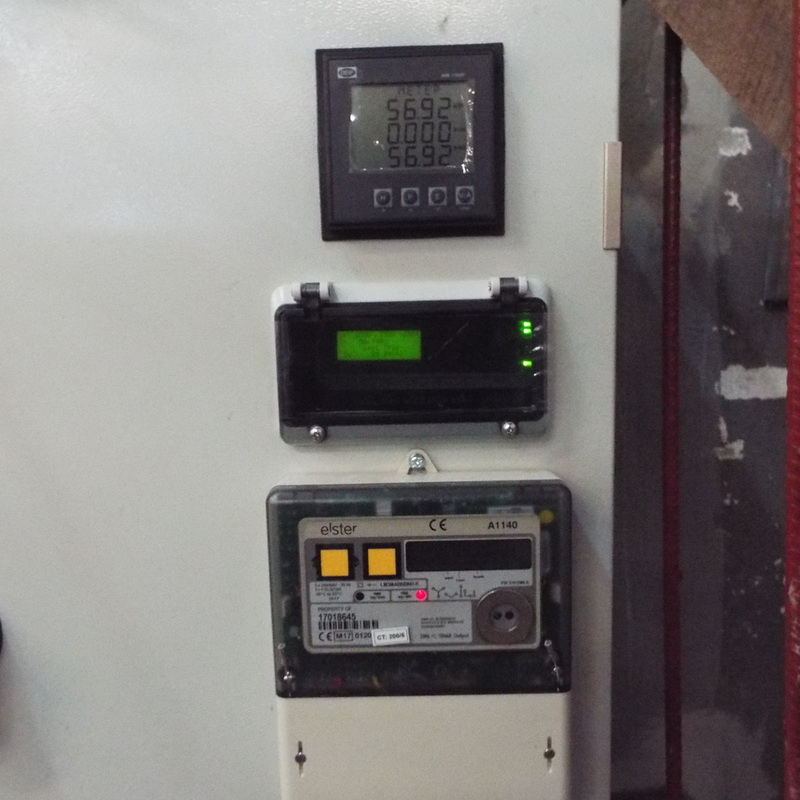 The G59 panel also has a DEIF MIB 7000C meter and an Elster 1140 Meter installed. 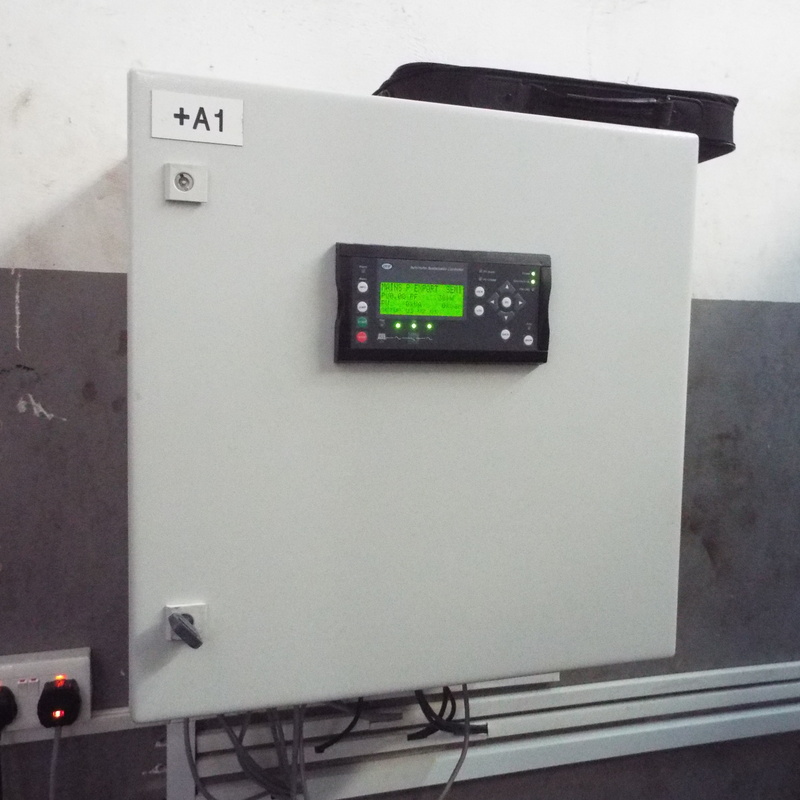 The DEIF MIB 7000C Meter is used to send PV Energy Production to the DEIF Control. The Elster 1140 Meter is connected to an LDC which allows data to be sent via a sim card so that the PV Energy output can be monitored. 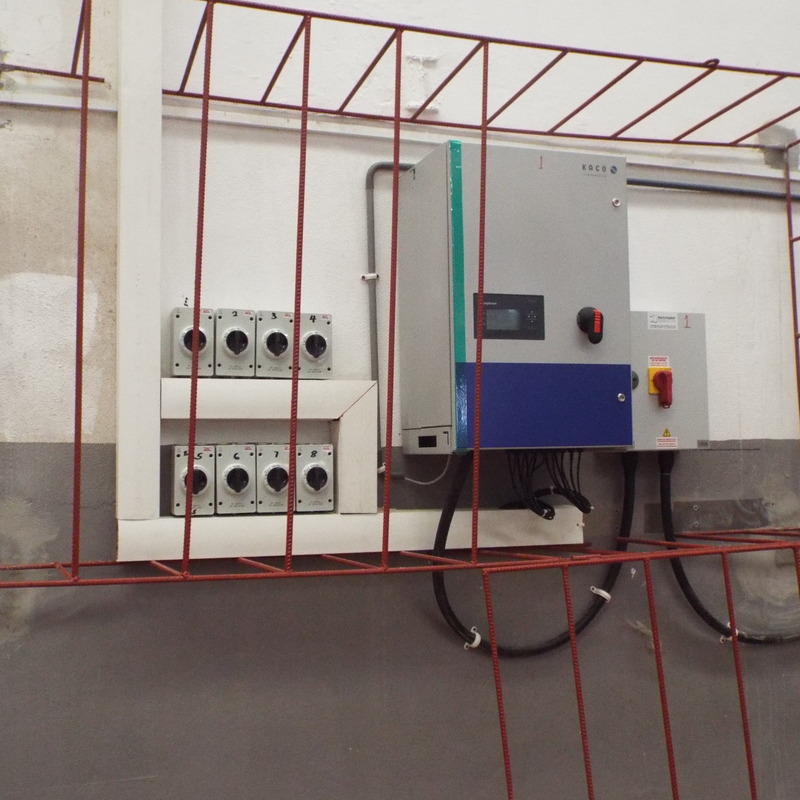 The G59 Control Panel output is then connected to the sites electrical system and therefore allows energy from the two Kaco Inverters to pass through to the sites electrical system provided the sites electrical system is electrically alive. The DEIF Switchboard is used so as to determine where power is coming from and to control the output of the PV Inverters when connected to the generator. 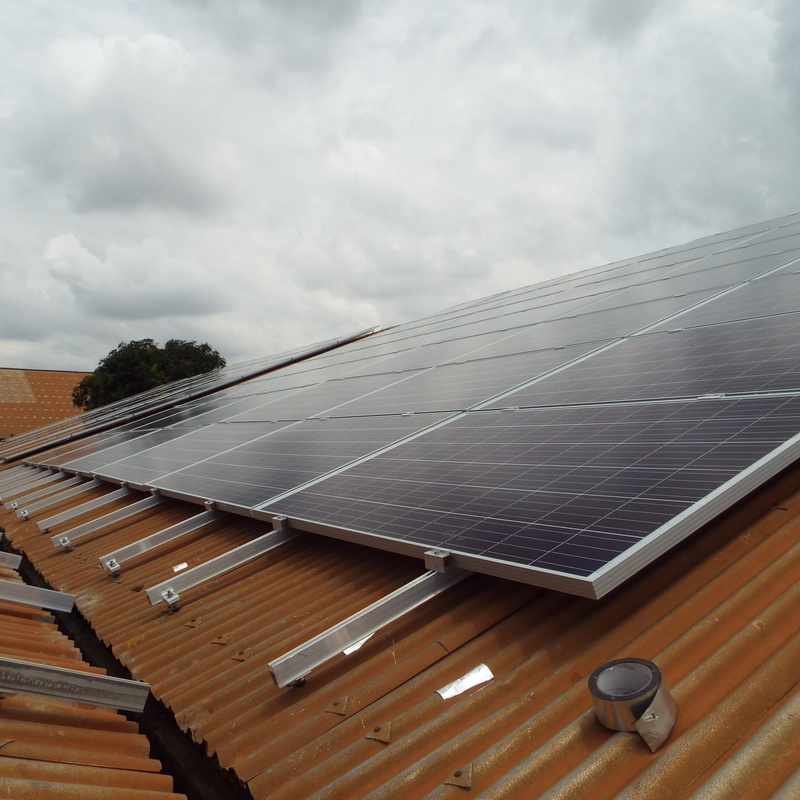 As the Kaco Inverters are grid tied when mains power is available the two Inverters will start supplying energy assuming that it is daylight and the modules are producing power. Any excess energy not being used by the load on site will then be exported to the grid. (As the site has Net Metering any exported kWh can be imported for free at the moment). If the Generator is operating and there is no Mains supply the PV Inverters will see the correct Voltage and Frequency and will start producing energy. If the sites electrical load is high the PV energy being generated will be absorbed by the sites load and will not be an issue however if the load drops low the excess PV energy being generated must go somewhere and the only place would be to the Generator and this cannot be allowed to happen as the Generator will be damaged. The DEIF Switchboard monitors the supply from the Mains, the supply from the Generator as well as the PV energy from the PV installation. When the DEIF Switchboard sees that the supply is from the Mains it will allow the PV system to generate at 100% and any excess to be exported to the grid. However, when the DEIF Switchboard sees that the Generator is the source of power it will start controlling the amount of energy supplied by the PV installation. 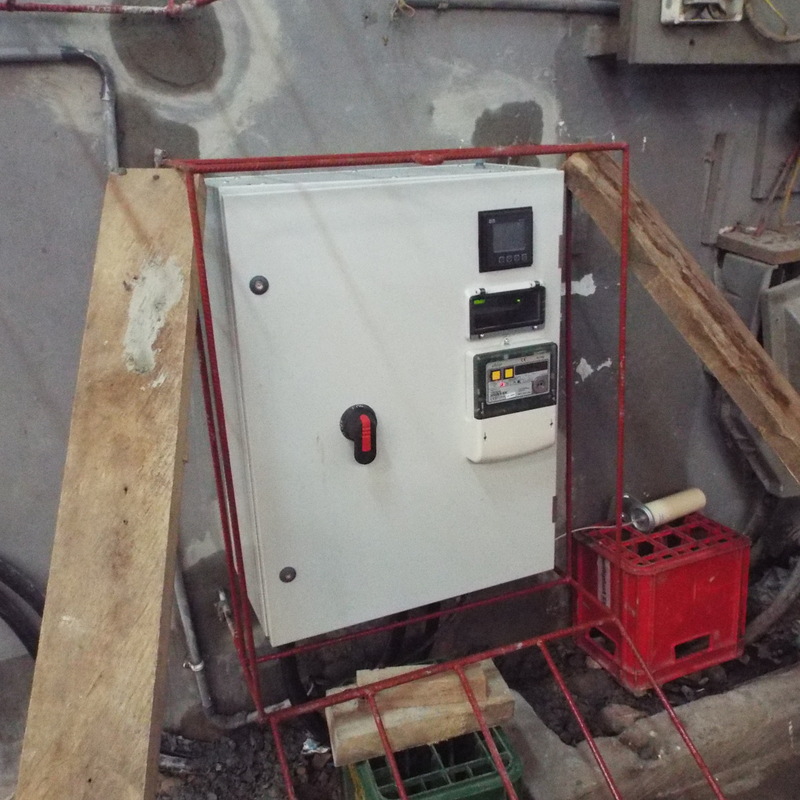 The DEIF Controller would normally be set so that when the Generator is providing 30% or more of the Generators rated load it will allow the PV Inverters to operate and provide anything from 0% to 100% depending on the sites electrical load requirement. If the sites electrical load is below 30% of the Generators rated load then 0% of PV Energy will be allowed to be generated. 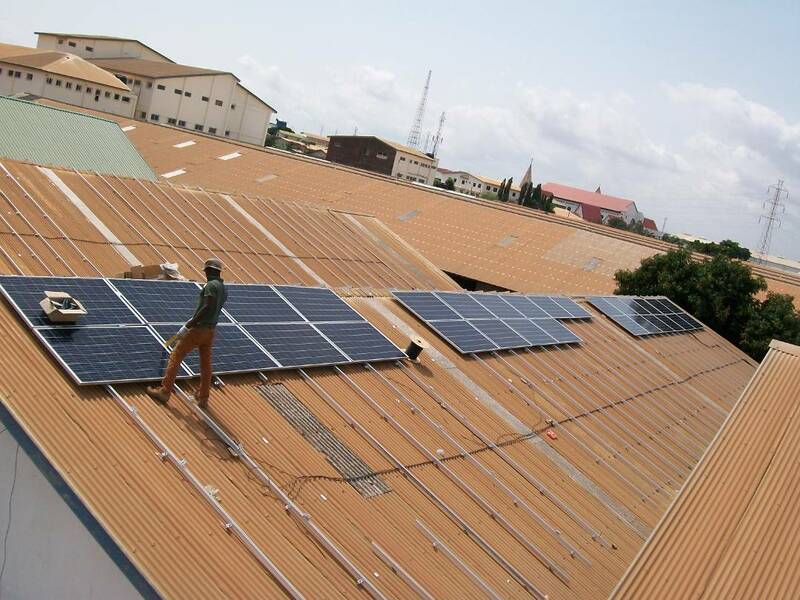 As the sites electrical load increases above 30% of the Generators rated load the amount of PV generated power will increase until the PV generated is 100%. If the sites electrical load requirement continues to increase then the Generator will then increase the amount of power that it is generating. As explained above the DEIF Switchboard therefore controls the PV Inverters outputs when the Generator is supplying the load so that the Generators output will not fall below 30% when PV is being generated or if the Mains is supplying the sites load will allow the PV Inverters to generate as much power as is available from the Modules depending on the Suns position temperature etc. The DEIF Switchboard measures the power being supplied by either the Mains, the Generator of the PV inverters by using Current Transformers (CT’s) and by measuring the actual voltage on each phase and neutral. The three CT’s for each supply and the three phase voltages and neutral voltage all go to a MIB 7000C meter in the DEIF Switchboard which measures the energy from that power source. In this instance we have three CT’s on the Mains supply and then we also have three CT’s on the Generator supply. The PV supply had CT’s installed in the G59 panel with the voltage measurements also being taken in the G59 panel. These three MIB 7000c meters then sent the energy being supplied by each source to the ASC Controller in the DEIF Switchboard panel. The DEIF Switchboard connects directly with the two Kaco Inverters so that the ASC Controller can communicate with two Kaco Inverters so that the ASC controller can control the output of the inverters. Signals are also provided from the Mains Disconnect, the Generator Disconnect as well as the MainsPro relay in the G59 panel which show whether the disconnect is open or closed. To get the signals from the Mains Disconnect and the Generator Disconnect additional auxiliary switches were added into the ABB Disconnects that controlled the supplies from either the Mains supply or the Generator supply. The DEIF Switchboard has a display screen on the front panel where control of the ASC Controller can be made allowing it to be switched OFF or On, settings to be made and different screens for different information to be accessed. 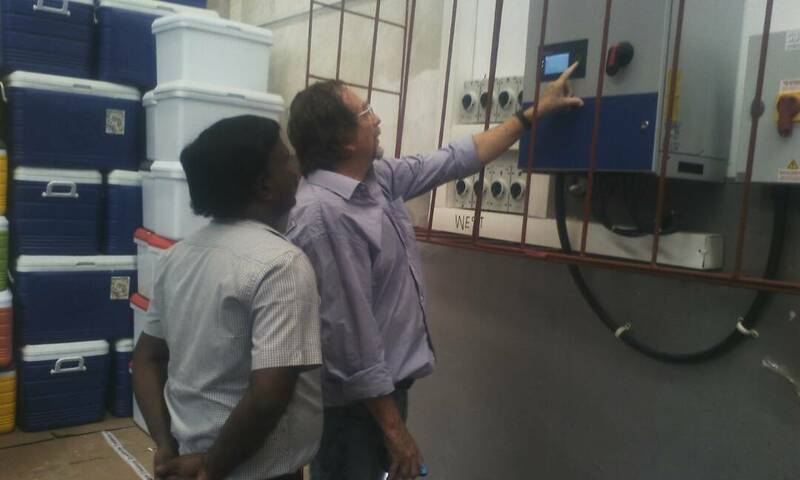 Once commissioned training was provided to our customer and the factory manager by the DIEF engineer and Derek, our technical manager for overseas projects, who were in Ghana to assist with the installation and oversee commissioning of the system.